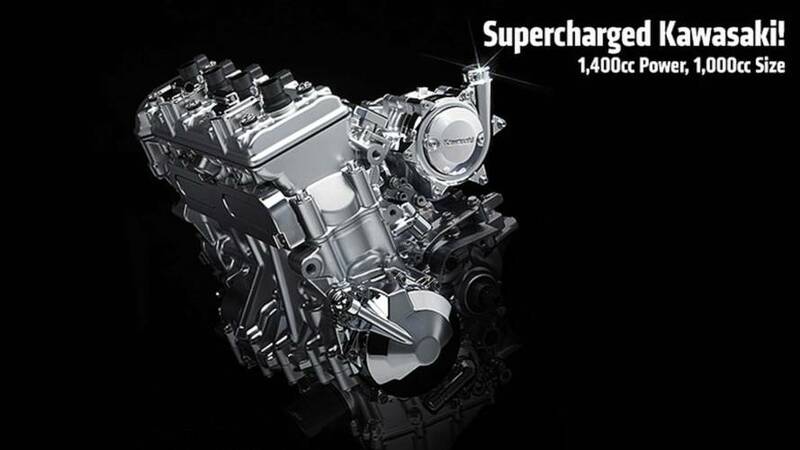 A world-first from a mainstream manufacturer, the Kawasaki Supercharged Motorcycle engine should produce big power in a small package. What you are looking at here is the first production motorcycle engine from a major manufacturer to be fitted with a supercharger. The idea is more power from a smaller motor. The Kawasaki supercharged motorcycle engine was unveiled today at the Tokyo Motor Show. "Kawasaki Heavy Industries, Ltd. also has a long history of developing technologies for turbine engines," states the company. "The lifeblood of these turbines is their blades, which need to be able to cope with extreme heat and vibration while spinning at high speeds. Know-how from years of designing turbine engine blades was instilled in the first supercharger developed by a motorcycle manufacturer. And of course, designing a motorcycle-use supercharged engine in-house means that maximum efficiency could be pursued." Kawasaki, of course, also has experience producing supercharged Jet Skis. Their Ultra 300 range makes 300 bhp from just 1,498cc. No further details of the motor are currently forthcoming, but England's MCN reports that the engine is said to be "close to 1,000cc" and could power the next generation ZX-14R.